Definition at line 58 of file llhudeffectlookat.h. Definition at line 241 of file llhudeffectlookat.cpp. References clearLookAtTarget(), gGirlAttentions, loadAttentions(), and mAttentions. Definition at line 256 of file llhudeffectlookat.cpp. Initializes the mTargetPos member from the current mSourceObjec and mTargetObject (and possibly mTargetOffsetGlobal). When mTargetObject is another avatar, it sets mTargetPos to be their eyes. Has the side-effect of also calling setAnimationData("LookAtPoint") with the new mTargetPos on the source object which is assumed to be an avatar. Definition at line 581 of file llhudeffectlookat.cpp. References LLAgent::cameraCustomizeAvatar(), LLQuaternion::DEFAULT, gAgent, LLAgent::getPosAgentFromGlobal(), LLViewerObject::getPositionAgent(), LLViewerObject::getRenderPosition(), LLViewerObject::getRenderRotation(), LLJoint::getWorldPosition(), LLXform::getWorldRotation(), gNoRender, LLPrimitive::isAvatar(), LLVOAvatar::isSelf(), LOOKAT_TARGET_FREELOOK, LOOKAT_TARGET_MOUSELOOK, LLVector3d::magVecSquared(), LLViewerObject::mDrawable, LLVOAvatar::mHeadp, MIN_TARGET_OFFSET_SQUARED, LLHUDObject::mSourceObject, LLHUDObject::mTargetObject, mTargetOffsetGlobal, mTargetPos, mTargetType, LLPointer< Type >::notNull(), LLCharacter::setAnimationData(), LLVector3d::setVec(), and LLVector3::setVec(). Definition at line 452 of file llhudeffectlookat.cpp. References ANIM_AGENT_HEAD_ROT, LLVector3d::clearVec(), LOOKAT_TARGET_NONE, LLHUDObject::mSourceObject, LLHUDObject::mTargetObject, mTargetOffsetGlobal, mTargetType, LLPointer< Type >::notNull(), and NULL. Referenced by LLHUDEffectLookAt(), markDead(), setLookAt(), unpackData(), and update(). Definition at line 69 of file llhudeffectlookat.h. Definition at line 71 of file llhudeffectlookat.h. Definition at line 70 of file llhudeffectlookat.h. Definition at line 466 of file llhudeffectlookat.cpp. References clearLookAtTarget(), LLHUDObject::markDead(), LLHUDObject::mSourceObject, LLPointer< Type >::notNull(), and NULL. Definition at line 263 of file llhudeffectlookat.cpp. References _PREHASH_TypeData, LLMessageSystem::addBinaryDataFast(), LLFrameTimer::getElapsedTimeF32(), htonmemcpy(), LOOKAT_TYPE, mData, LLVector3d::mdV, mLastSendTime, LLHUDObject::mSourceObject, LLHUDObject::mTargetObject, mTargetOffsetGlobal, mTargetType, mTimer, MVT_LLUUID, MVT_LLVector3d, MVT_U8, LLUUID::null, LLHUDEffect::packData(), PKT_SIZE, SOURCE_AVATAR, TARGET_OBJECT, and TARGET_POS. Definition at line 490 of file llhudeffectlookat.cpp. 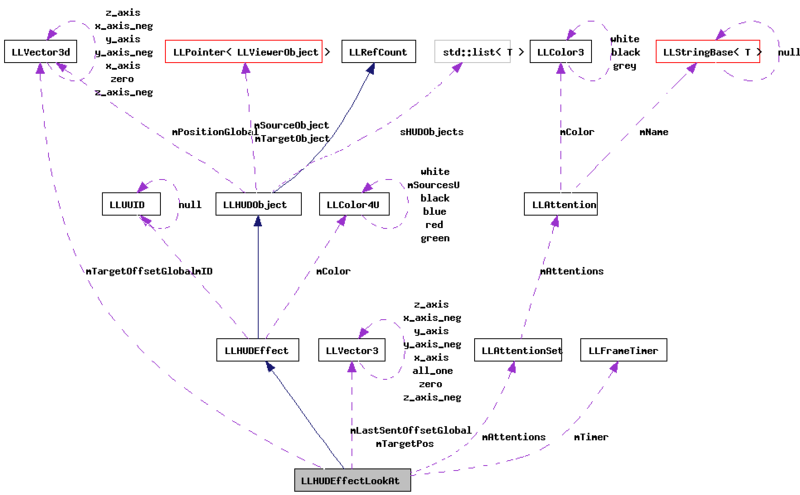 References f, glBegin, glEnd, glPopMatrix, glTranslatef, LLHUDObject::mSourceObject, mTargetPos, mTargetType, LLColor3::mV, LLPointer< Type >::notNull(), sDebugLookAt, target, VBLUE, VGREEN, VRED, VX, VY, and VZ. Definition at line 394 of file llhudeffectlookat.cpp. References clearLookAtTarget(), dist_vec(), f, FALSE, gAgent, LLFrameTimer::getElapsedTimeF32(), LLAgent::getPosGlobalFromAgent(), llassert, LOOKAT_NUM_TARGETS, LOOKAT_TARGET_CLEAR, mAttentions, MAX_SENDS_PER_SEC, LLHUDEffect::mDuration, MIN_DELTAPOS_FOR_UPDATE, mKillTime, mLastSendTime, mLastSentOffsetGlobal, LLHUDObject::mSourceObject, LLHUDObject::mTargetObject, mTargetOffsetGlobal, mTargetType, mTimer, LLHUDEffect::setDuration(), LLHUDEffect::setNeedsSendToSim(), LLVector3d::setVec(), TRUE, and update(). Definition at line 478 of file llhudeffectlookat.cpp. Definition at line 375 of file llhudeffectlookat.cpp. Definition at line 384 of file llhudeffectlookat.cpp. Definition at line 306 of file llhudeffectlookat.cpp. References _PREHASH_Effect, _PREHASH_ID, _PREHASH_TypeData, clearLookAtTarget(), LLViewerObjectList::findObject(), gAgent, LLMessageSystem::getUUIDFast(), gObjectList, htonmemcpy(), LLPrimitive::isAvatar(), LLUUID::isNull(), LLPointer< Type >::isNull(), llendl, llwarns, LOOKAT_TARGET_NONE, LOOKAT_TYPE, LLUUID::mData, LLVector3d::mdV, LLAgent::mLookAt, mTargetType, MVT_LLUUID, MVT_LLVector3d, MVT_U8, PKT_SIZE, S32, setSourceObject(), setTargetObjectAndOffset(), setTargetPosGlobal(), size, SOURCE_AVATAR, TARGET_OBJECT, TARGET_POS, and LLHUDEffect::unpackData(). Definition at line 521 of file llhudeffectlookat.cpp. References ANIM_AGENT_HEAD_ROT, calcTargetPosition(), clearLookAtTarget(), f, gBoyAttentions, LLFrameTimer::getElapsedTimeF32(), LLCharacter::getSex(), gGirlAttentions, LLPointer< Type >::isNull(), LLMotion::isStopped(), LOOKAT_TARGET_NONE, markDead(), mAttentions, mKillTime, LLHUDObject::mSourceObject, LLHUDObject::mTargetObject, mTargetType, mTimer, sDebugLookAt, LLHUDEffect::setNeedsSendToSim(), SEX_MALE, and TRUE. Definition at line 61 of file llhudeffectlookat.h. Definition at line 98 of file llhudeffectlookat.h. Referenced by LLHUDEffectLookAt(), setLookAt(), and update(). Definition at line 94 of file llhudeffectlookat.h. Referenced by setLookAt(), and update(). Definition at line 97 of file llhudeffectlookat.h. Referenced by packData(), and setLookAt(). Definition at line 93 of file llhudeffectlookat.h. Definition at line 92 of file llhudeffectlookat.h. Referenced by calcTargetPosition(), clearLookAtTarget(), getTargetOffset(), packData(), setLookAt(), setTargetObjectAndOffset(), and setTargetPosGlobal(). Definition at line 96 of file llhudeffectlookat.h. Referenced by calcTargetPosition(), getTargetPos(), and render(). Definition at line 91 of file llhudeffectlookat.h. Referenced by calcTargetPosition(), clearLookAtTarget(), getLookAtType(), packData(), render(), setLookAt(), unpackData(), and update(). Definition at line 95 of file llhudeffectlookat.h. Referenced by packData(), setLookAt(), and update(). Definition at line 88 of file llhudeffectlookat.h. Referenced by init_debug_avatar_menu(), render(), and update().